The following families have genealogy eBooks on this page: Boarman, Bradford & Waters, Brinton, Bromwell, Burbeen, Call, Chatfield, Clarke, Davenport, Dodge, Fenno, Frost, Smythies, Talmage, Washburn, and Weekes. Welcome to Bookshelf 4 at Hawkeyes Trading Post! 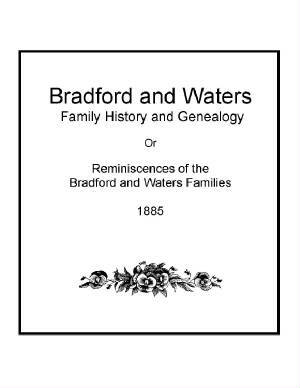 Bradford and Waters Family History and Genealogy or Reminiscences of the Bradford and Waters Families. PDF eBook English 1.04 MB. 1885. In 1882 a book entitled “Ancestry of the Waters Family of Marietta, Ohio” was published by Mr. Wilson Waters. However, at that time papers containing a short interesting history of the Bradford Family from 1505 to 1757 were unknowing held by members of his mother’s family the Waters. This is the family of renown Governor William Bradford and the Plymouth Plantation. Extraordinary information for anyone in the Bradford or Waters Families. Price $6.95 USD. 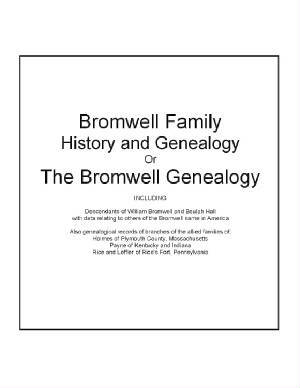 Bromwell Family History and Genealogy or The Bromwell Genealogy. PDF eBook English 8.86 MB. 1910. Including descendants of William Bromwell and Beulah Hall with data relating to others of the Bromwell name in America. Also genealogical records of branches of the allied families of: Holmes of Plymouth County, Massachusetts; Payne of Kentucky and Indiana; Rice and Leffler of Rice’s Fort, Pennsylvania. With some descendants of Major Conrad Lefler of Pennsylvania, and of the Rev. Peter Fullenwider, Rev. Jasper Simler, and Jonathan Boone of Kentucky. Eighty illustrations! An abundance of information for anyone in the Bromwell family! Circa 1735 to 1910. Price $6.95 USD. 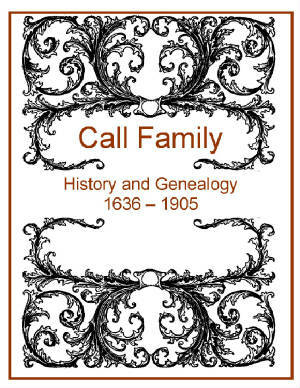 Call Family History and Genealogy. PDF eBook English 3.58 MB. 1908. Thomas Call was a Tile Maker from Faversham in Kent County England. He came to the American Colonies in 1636 with his wife Bennett and their 3 children. This is a very detailed publication with many letters, biographical sketches of family descendants, and 9 generations! Essential dates are provided for kindred from the year 1636 to 1905. A wonderful reference for any family member! Price $6.95 USD. 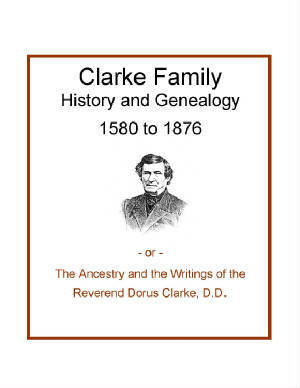 Clarke Family History and Genealogy or The Ancestry and the Writings of the Reverend Dorus Clarke, D.D.. PDF eBook English 1.24 MB. 1876. The good Reverend researched his ancestry back to John Clarke in 1691 and then lists his descendants for six generations to 1876. Also, the ancestry of Richard Lyman, the good Reverends mother’s family is listed from 1580. This shows seven generations up to the year 1775! Extraordinary information for anyone of the Clarke, Clark, or Lyman families interested in family genealogy! Price $6.95 USD. 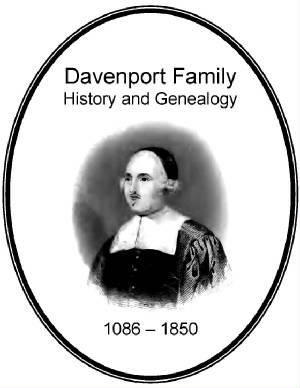 Davenport Family History and Genealogy or A History and Genealogy of the Davenport Family. PDF eBook English 16.5 MB Printed 1851. This detailed historical account will guide you from the 12th century up to the mid 1800s with several Davenport family etchings, and details on the family Coat of Arms! Essential dates of family descendants are documented from the year 1086 up to 1850, with historical information on the Township of Davenport, County of Chester, in England. 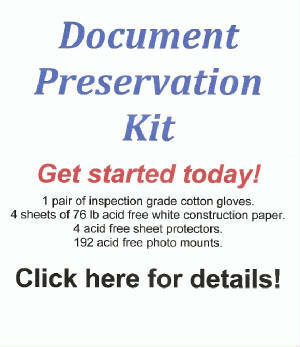 An outstanding genealogical reference for all Davenport family members! Price $6.95 USD. 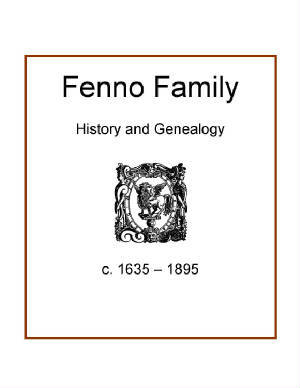 Fenno Family History and Genealogy. PDF eBook English 724 KB. 1898. John Fenno was granted 20 acres of land in Milton in 1660. Descendants of 4 generations are listed to the year 1895. Saved from certain deterioration, the ink has faded with time on the original printed publication. Therefore, the contrast will need adjusting on your eBook screen to fine tune the print. Still readable, the information provided may be unique and quite valuable for Fenno family genealogists! Price $6.95 USD. 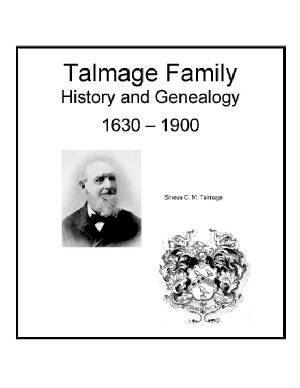 Talmage Family History and Genealogy or The Talmage Genealogy. PDF eBook English 2.44 MB. 1901. This writing details family lore that the Talmage name is one of the most ancient in English history, and is traditionally believed to go back to Saxon times to Toelmag, a Saxon Lord of the 6th century. More modern documentation substantiates the arrival of Thomas Talmage in 1630 to the shores of New England. 8 generations from Thomas are compiled in this wonderful source for genealogy! Price $6.95 USD. 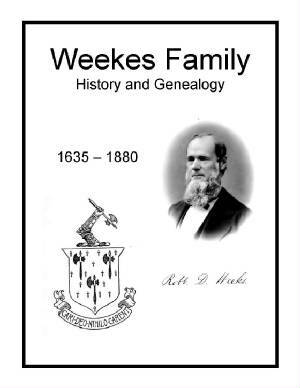 Weekes Family History and Genealogy or Genealogy of the Family of George Weekes. PDF eBook English 21.9 MB. 1885. Here is found the legend of the origin of the Weekes family name, which reaches back over 940 years to 1068 AD. Vital records of descendants are compiled for over 245 years, and span the period from 1635 to 1880. Several portraits are included, with more than 1100 descendants of George Weekes. There are 57 pages of alphabetically indexed names! This is a treasure of genealogical information! Price $6.95 USD. 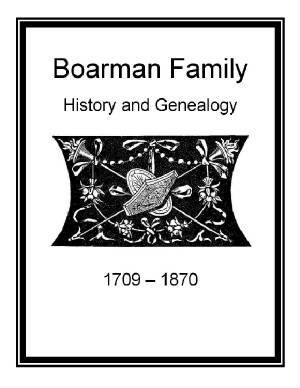 Boarman Family History and Genealogy or Genealogy of the Boarman Family. PDF English 1.41 MB. 1897. The Boarmans are of English origin. Their home was in Devonshire and Somersetshire Counties of England. It is related that the inhabitants of these counties were annoyed by boars and that, for their services in exterminating these animals, the family acquired the name of Boarman and the right to heraldic shield and crest. The Boarmans came to Maryland in 1645, and the plantation called “Boarmans Rest” came into being. Essential dates for family descendants extend from 1709 to 1870! A wonderful reference for the family genealogist! Price $6.95 USD. Brinton Family History and Genealogy. PDF eBook English 2.88 MB. 1878. 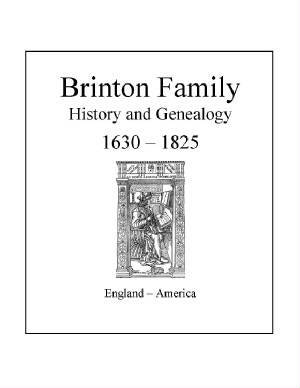 This eBook of the Brinton Family contains a sketch of its history in England from the origin of the name, about 1100 A.D., until the emigration of the first settler to the American Colonies in about the year 1684. An abundance of information regarding the first colonist, William Brinton, and his immediate family, with descendants to and including the seventh generation! This spans the period from about 1630 to 1825! A great resource for Brinton genealogy! Price $6.95 USD. Burbeen Family History and Genealogy or An Account of John Burbeen. PDF eBook English 1.87 MB. 1892. 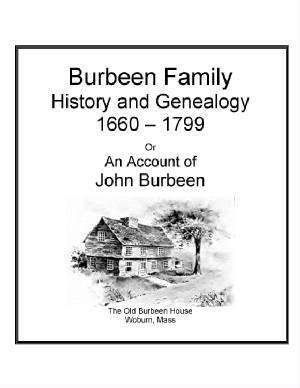 An account of John Burbeen, who came from Scotland and settled at Woburn, Massachusetts, about 1660, and of descendants as have borne the surname of Burbeen. Compiled from the town records of Woburn, epitaphs of its first and second burying grounds, manuscript records of Charles Walker, Esq., of Concord, New Hampshire, and sundry other sources. An abundance of information for anyone with this surname! Price $6.95 USD. 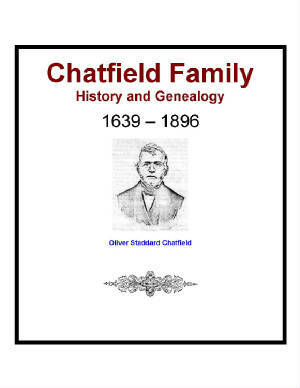 Chatfield Family History and Genealogy. PDF eBook English 1.73 MB. 1896. Three brothers, Francis, George and Thomas Chatfield, came from England in 1639, in the Reverend Henry Whitfield’s company to Guilford, Connecticut, where Francis died unmarried in 1647. Thomas Chatfield married Ann Higginson and moved to Easthampton, Long Island, where he was a long time magistrate. George Chatfield’s second marriage with Isabel Nettleton allowed for three children, the first being born in 1661. Extraordinary listing of descendants from 1639 to 1876! Price $6.95 USD. Dodge Family History and Genealogy or Dodge Genealogy. PDF eBook English 7.28 MB. 1904. The book begins with Tristram Dodge (Circa 1645 – 1720) who was an indentured servant that arrived in the American Colonies about 1661. He became a freeman May 4th of 1664. From Tristram the numerous descendants include 8 generations of people from the Long Island, New York, and East Haddam, Connecticut regions. Validation includes the Dodge Family in England. The book provides many rare ancestral photographs and etchings; and a remarkable documentation of the Dodge Family Coat of Arms. 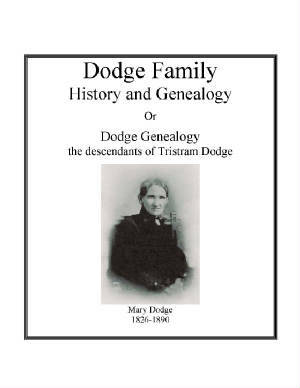 A must for all Dodge Family genealogists! Price $6.95 USD. Frost Family History and Genealogy. PDF eBook English 2.28 MB. 1852. Nicholas Frost likely came from the town of Tiverton, England, and then settled in the wilderness among the Native Americans at Sturgeon Creek, Elliot, Maine about 1636. Essential names of his descendants, with dates, are documented in this publication, which extends over a period of 215 years, from 1636 up to 1851. Unique information regarding the family legacy may be found in this 25 page publication printed 10 years prior to the American Civil War. 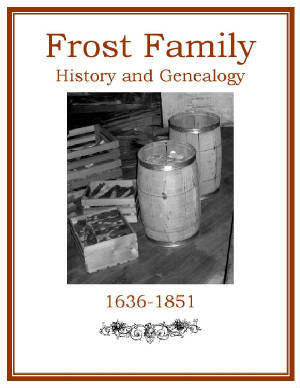 A great source of documentation for the Frost family genealogist! Price $6.95 USD. 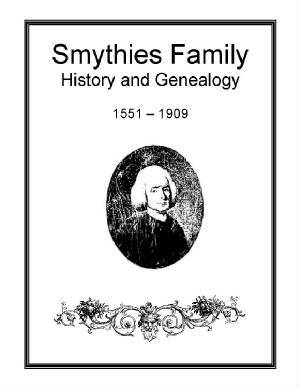 Smythies Family History and Genealogy or Records of the Smythies Family. PDF eBook English 10.5 MB. 1912. A Smythies family history with short biographies, and details on the origin of the family name with different variations. Ancestors have been compiled which span the years from 1551 to 1909. There are 15 pages of alphabetically indexed names for over 1500 ancestors and in-laws! An excellent resource for Smythies genealogy! Price $6.95 USD. Washburn Family History and Genealogy or Genealogical Notes of the Washburn Family. PDF eBook English 4.67 MB. 1898. The book contains a brief history of the family in England, and then a full record of the descendants of Israel Washburn of Raynham. The family history spans the years from 1755 to 1841. Descendants are then indexed alphabetically in 4 pages for easy reading and research. 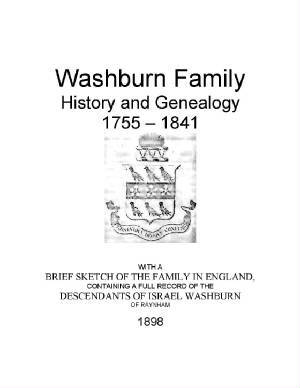 A great resource of Washburn genealogy! Price $6.95 USD.